Safety netting has been installed over the dugouts at Globe Life Park in Arlington ahead of the start of the 2016 season. The Texas Rangers announced Thursday new safety improvements recently installed at Globe Life Park in Arlington. Protective netting has been installed above the dugouts, designed to protect fans sitting in the lower bowl, behind the dugouts, from flying bats and fast-moving foul balls. 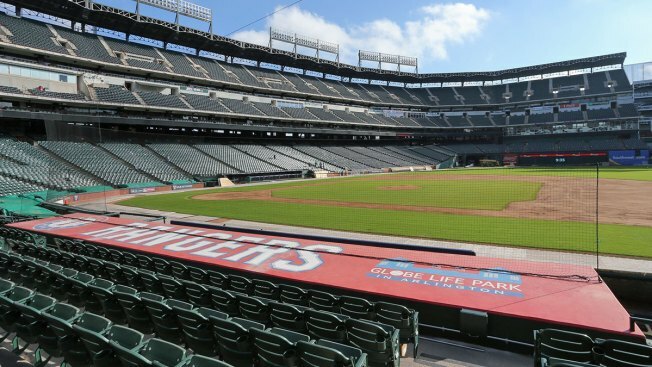 Rob Matwick, Rangers Executive Vice President for Business Operations, said fan safety is the team's top priority at the ballpark and that while they were in compliance with MLBs current guidelines they felt it made sense to add the netting to make the park as safe as it could be. The new netting, at a height of six feet, extends from the end of the home plate screen toward the outfield fence to the end of each dugout -- a distance of about 68 feet. “We fully understand that it may take some time for fans to be accustomed to this change and that some fans may have a different preference for their ballpark experience. We will do our best to accommodate the requests of any fan who is affected by the changes," said Matwick. The team said they will also offer to relocate any fan from their original seat to one that has added protection, based on availability. The team also plans to add signage warning fans about the dangers posed by flying bats and balls.